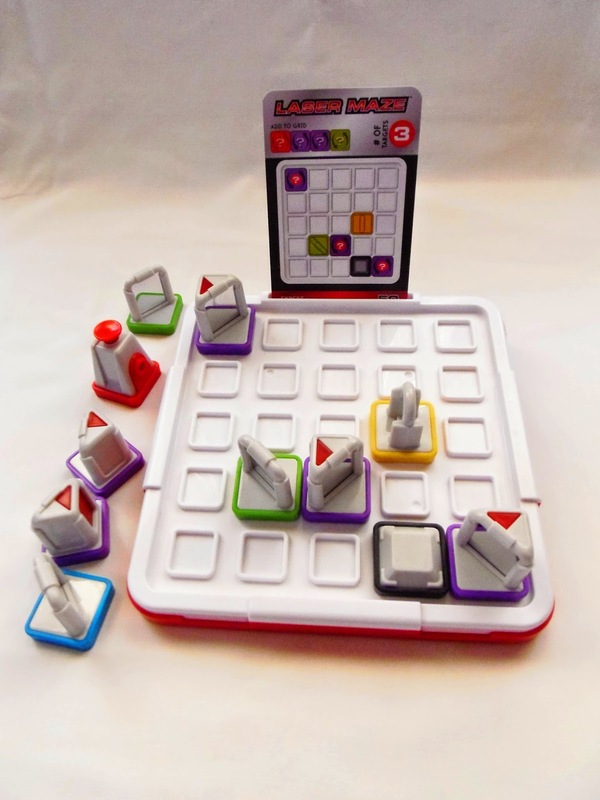 Laser Maze, by ThinkFun, has captivated my curiosity ever since I first saw it, a couple of years ago. It's easy to get me excited about any type of logic games, but by adding lasers, my interest has increased even more. Now, I have finally got a copy, and it has far exceeded my expectations so far. I was actually surprised when I first heard about the Laser Maze. I thought, "how can they commercialize a toy with lasers? ", "is it safe for kids?" - Well, as it turns out the laser can't harm your eyes or skin, under normal circumstances, because it's a class 1 laser - Not enough power to do any damage, whatsoever. Any kid aged 8-99 can safely play with Laser Maze without worrying about safety precautions. The game comes packed with all sorts of cool light-manipulating objects: a laser, mirrors, beam splitters, a double-mirror , the works... To get you started, a collection of 60 challenge cards is included, divided in four difficulty levels, from beginner to expert (15 per level), but even after you run out of challenges to solve, you can try to create your own ever-more-complex light-bending displays. I'll be honest. Understanding how the game works and interpreting the symbols in the challenge cards can be a little discouraging and frustrating at first. I suggest you read the instructions that come with the game and start with the first challenges, so you can familiarize yourself with the concept. After doing that, I was breezing past the first difficult level. It gets harder as you progress, but not immediately, so you can proceed at your own pace. The goal of the game is to place the tokens as indicated on the chosen challenge card. Each card will tell you how many tokens and targets you're supposed to add to the game grid. This is where it becomes tricky at first: to determine which tokens to use, where to place them and figure out their orientation, which is sometimes undisclosed. When you think you have all worked out, just activate the laser and see if all your targets are light up. If not, you need to make some adjustments in their placement or their orientations. Note that you can only see the laser when it hits one of its targets, and never its path, as it's suggested on the game's package photo. But you already knew that if you know how lasers work, right? Anytime you get stumped in one of the challenges, you can always flip the card and see its solution. The game works like any other type of light were to be used. The mirrors and double-mirrors will bend the light in a 90º angle, although the beam splitters have a really cool effect where one beam is split in two: one is bent like any other regular mirror and the other goes straight through it in the same direction that hit it. The checkpoint is simply a transparent piece of glass that lets the light go in a straight line. Playing with lasers has never been more fun! The Laser Maze game has easily climbed to the top 3 of my favorite logic games of all time. 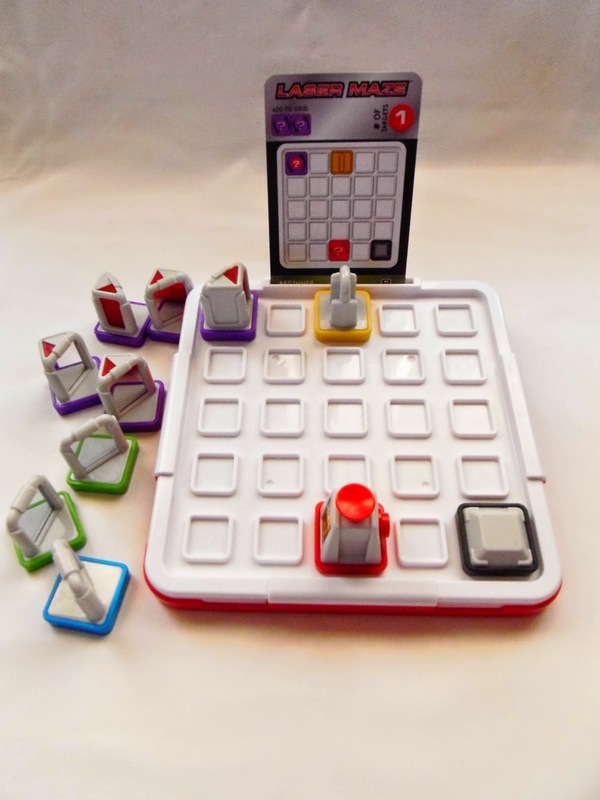 It's one of the absolute best games by ThinkFun, and it shouldn't come as a surprise that it has won the Best Toy Award by the Oppenheim Toy Portfolio. If you're remotely interested in logic games and/or lasers, you should definitely give this one a try. 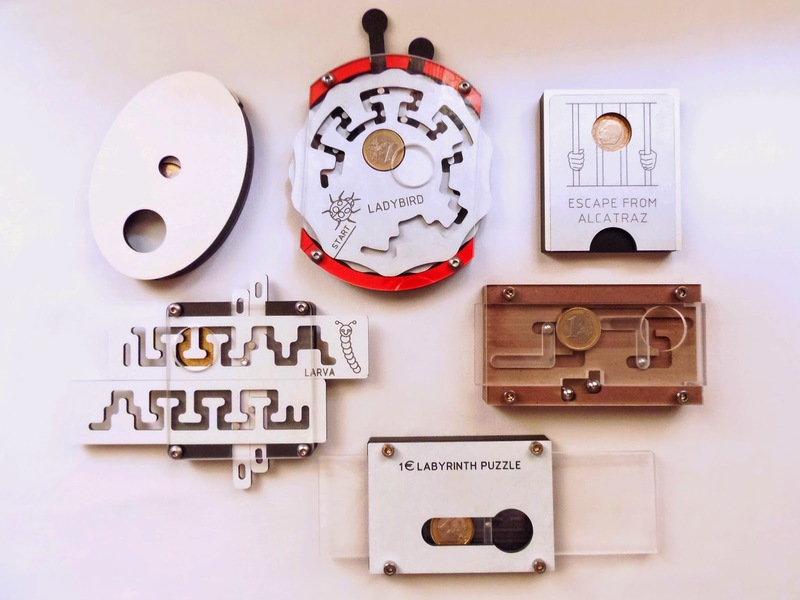 Availability: I got the Laser Maze from the Spanish online puzzle store PuzzlesdeIngenio.com. Worldwide shipping available. You can also browse other games by ThinkFun. Hanayama seems to release Cast Puzzles faster than I can get them. It looks like my Cast collection is always incomplete... My latest effort in keeping with the tradition of adding puzzles to a never-ending collection is the Cast U&U, an intriguing design by Kyoo Wong, who also designed the recent Cast Delta. The theme for the U&U is "complexity", but it might as well be complication, since it gives you no clues or hints for the solution. The puzzle was presented at this year's 34th IPP and was one of the winners of the Jury Grand Prize award. 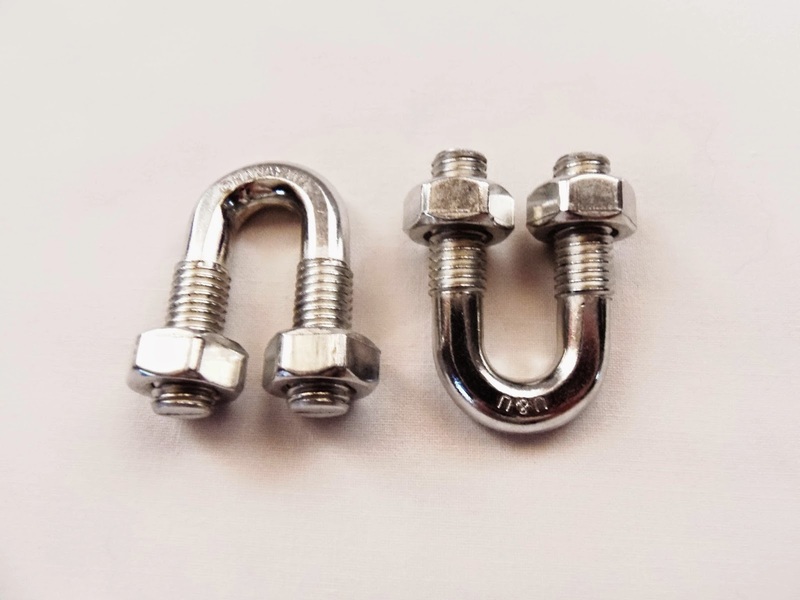 The Cast U&U is comprised of two almost identical U-shaped bolts and four almost identical nuts. These subtleties in the design are so small that you need to study each part very thoroughly. The two pieces have a natural silvery color, much like any other metal bolts, with no special coating - It would be scratched very easily otherwise. The size is quite small, but average for a Cast Puzzle, each part measuring 4.5cm in diameter (1.8"). The first thing you notice when you study the puzzle for the first time is that the nuts can rotate freely up and down the bolts, but they can't be removed. This immediately tells you that the solution must make use of the right positions for each nut. The bolts are not entirely round, they're actually flatten on both sides. 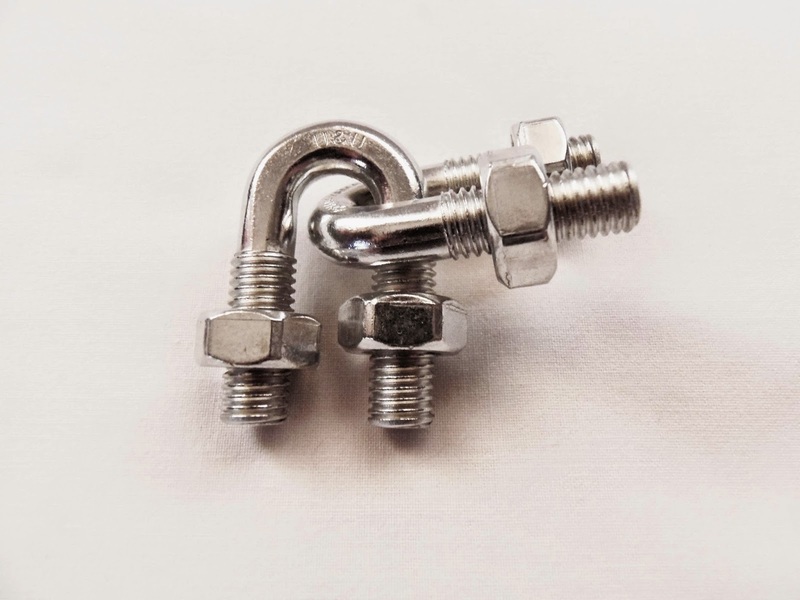 The aperture between the two ends of each bolt is so narrow that you can't separate them by simply pushing them out. Hanayama has rated the U&U as a level 4/6, but after having solved it within 10 minutes, I reckon it's not that challenging. Even putting it together again is not that difficult, although you have to keep the nuts correctly aligned, just like for when you solved it. The difficulty of the puzzle is pretty much finding the correct alignment of the nuts, which is easily overcome by a careful examination or at least some trial and error. Hanayama has yet again produced a great addition to the Cast Family. The U&U is a pleasure to play with, but that's already guaranteed with any Cast Puzzle. With 62 different designs already in the series, it's becoming increasingly difficult to choose the best ones. Nevertheless, this one belongs at least in the top 20. Availability: The Cast U&U is available at PuzzleMaster for $12.95 CAD. You can also find all the others of the Cast series. Continuing with the IQ series by SmartGames, this time I present you the IQ-Splash. This game is actually one of the exceptions among most designs launched by SmartGames, because it wasn't developed by Raf Peeters. Its origins go back from 1989 and it's also known as Lonpos - Cosmic Creature, for its irregularly-shaped pieces resembling a creature from outer space. 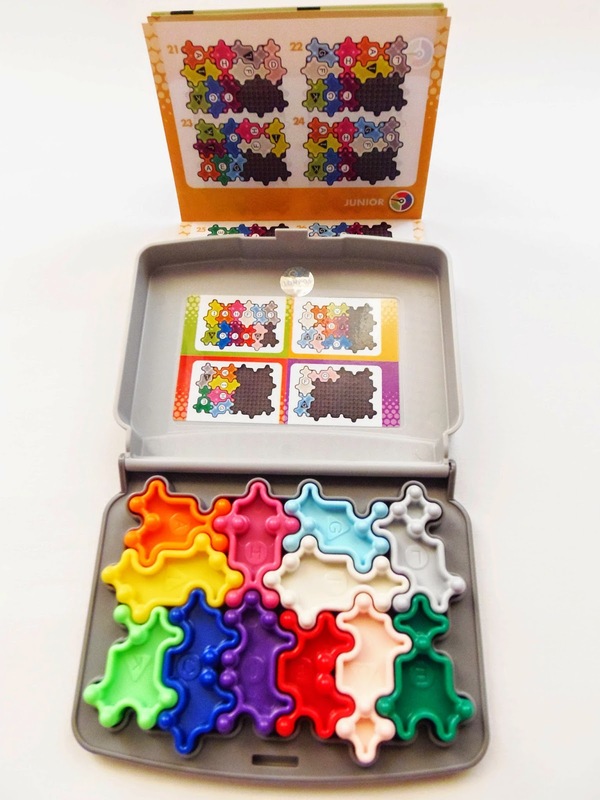 The name chosen by SmartGames invokes another resemblance as well, as the pieces also look like small puddles of water. It doesn't matter how you see the pieces though, since this is quite a challenging game. 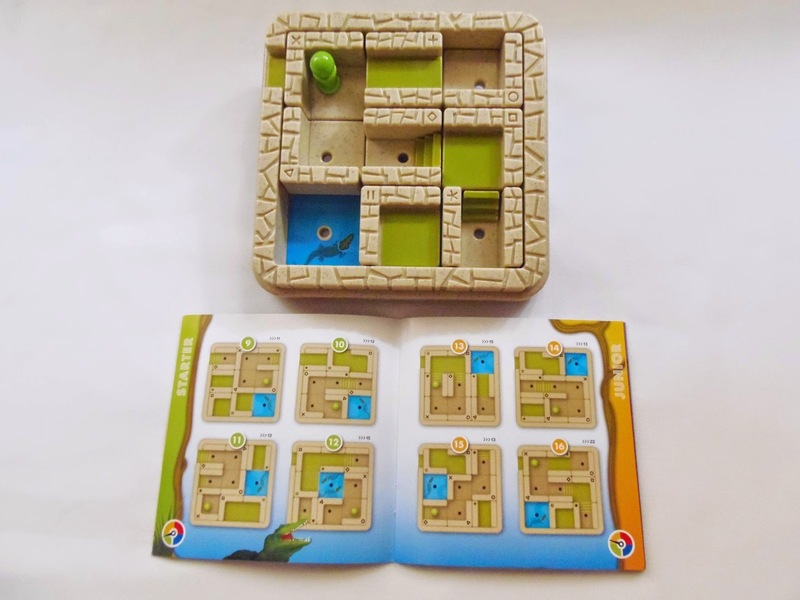 The game is presented in its original box with the Lonpos brand, and inside you can find a small booklet with 107 challenges divided in the usual five difficulty levels. On the backside of the box lid there's also four additional challenges to get you started. Unlike other SmartGames, the booklet doesn't provide you with solutions for its challenges, so you're on your own, for better or worse. The design of the game is, in my opinion, perfect. It comes in a small box with a simple closing mechanism, which is very convenient for your travels. The IQ-Splash consists of 12 irregular pieces, each in a different color and also a different letter. What's interesting is that there are six pieces that look different if you flip then on their vertical axis. To help you distinguish between these pieces, a triangle or a circle is shown together with its corresponding letter. Another design feature is the raised points on each piece, which helps to stimulate the nerve endings of your fingers. All the design choices above were made especially to help the brain development in children, because it strengthens visual, spacial and logical thinking skills. It can be, nevertheless, a great exercise for both children and adults, and especially elderly people, by keeping the brain healthy. From all the IQ games so far, this one seemed the most challenging, because of the irregular shape of the pieces, which makes it hard to visualize where each piece goes. 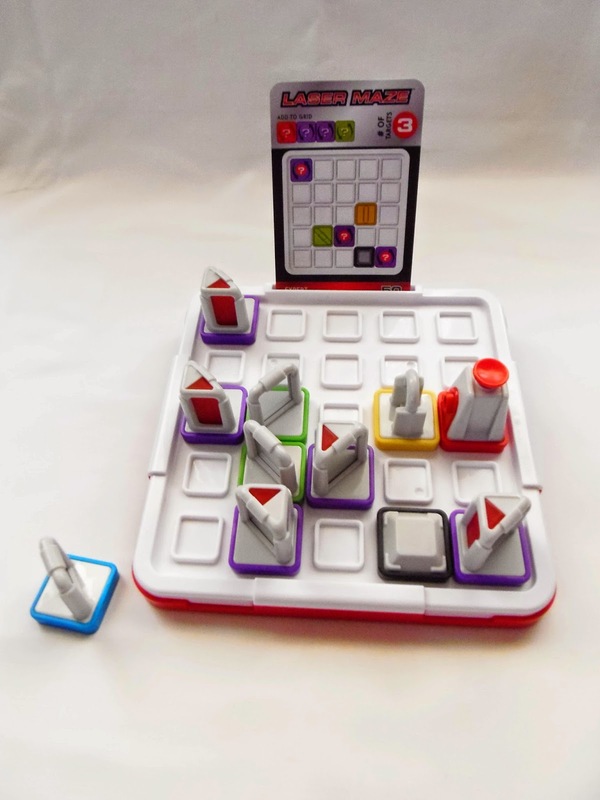 The game is fairly easy throughout most of the challenges presented in the booklet, but the last level (Wizard) becomes extremely difficult to solve, since only two or three pieces are already placed in the game board. Solving time for the Wizard levels is about 20/30 minutes. There may be more than one solution for some challenges, so it's always worth another try looking for an alternate solution. The IQ-Splash is a welcome addition to the IQ series. By including it in SmartGames' catalog, a popular brand, much more people can experience this great game that has been around for 25 years now. It's definitely a challenging game, but the easier levels make sure that everybody gets a fair chance at learning it and progress to more demanding levels at their own pace. 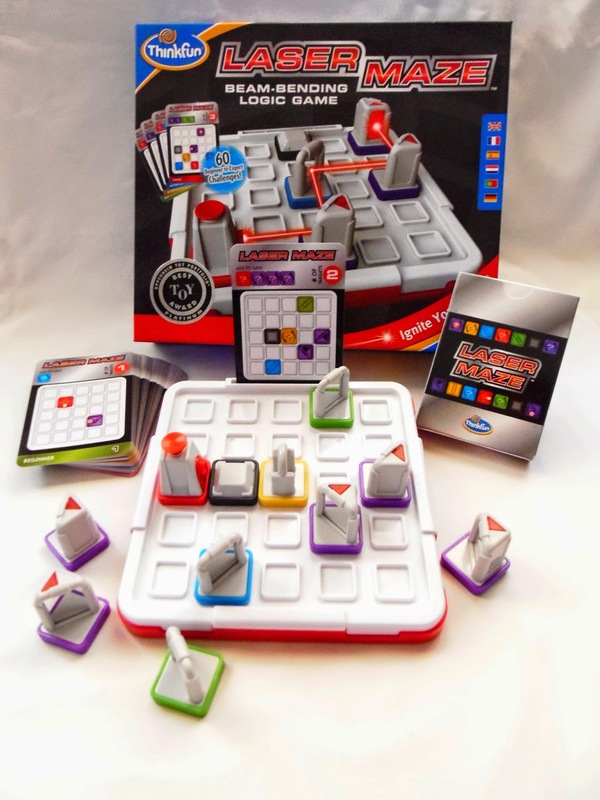 Availability: You can find the IQ-Splash at PuzzlesdeIngenio.com, as well as many others from SmartGames. I've been pointing out for a while that both Jean Claude Constantin and Jürgen Reiche (from Siebenstein-Spiele) have very similar designs, but I've always been able to distinguish them apart. Today, though, was the first time I mistook Constantin for Reiche, and the culprit was the Snowflake, a beautiful and elegant puzzle with a snowflake-like pattern on both the frame and its pieces. I like and respect both designers, so if they come up with similar ideas, my collection thanks them. This puzzle is rated as a difficulty level 9/10, but so far, it might as well be a level 10, as I haven't been able to solve it yet. The structure of the pieces is very complex, which hampers the solving process and makes trial and error your only option. Each hexagonal piece has three types of edges: a straight or flat edge; a pointy edge; and a dented edge. Any of the 19 pieces you choose will have a different combination of these types of edges, therefore making the solution extremely difficult. To make matters worse, the pieces are single-sided, meaning you can't use the backside in the solution, since it's not decorated with the engraved details. I can't be sure of how many solutions are there, but if I had to bet, I'd say there's only one, given the shape of the unique pieces and the way they interact with each other. 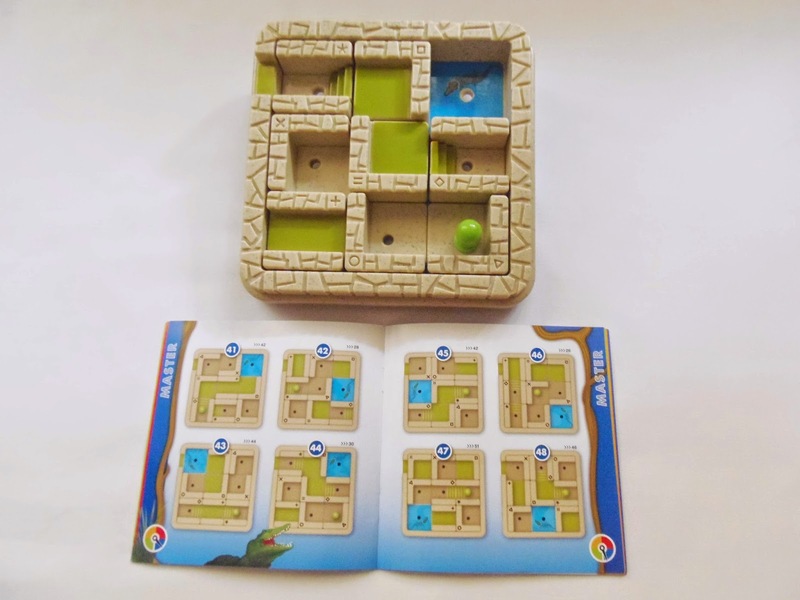 Whether it's a Siebenstein-Spiele puzzle or a Constantin one, you can be sure of one thing: their puzzles are very well made and challenging, and will be an excellent addition to any collection. As for the Snowflake, this one is highly frustrating, so go for it only if you're very patient. 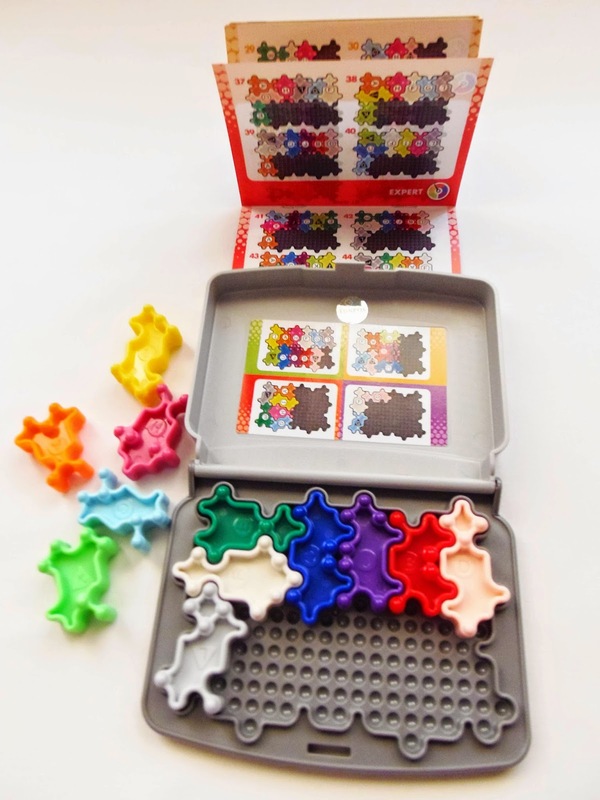 Availability: You can find the Snowflake puzzle at PuzzleMaster for $30.99 CAD. If you like Siebenstein-Spiele, then check out their other designs. The original Hungarian Rings is one of the most recognizable puzzles of all time. Its simple design and colorful appearance have fascinated enthusiasts all over the world since 1982. There have been many different variations, mostly flat (or 2D) puzzles, but one stands out among all of the previous ones. 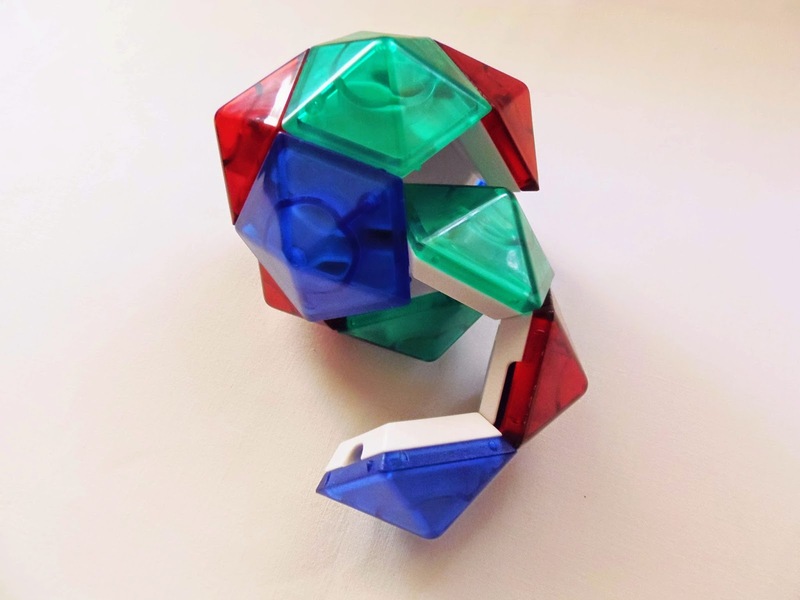 It's the Rubik's Rings, invented in 1999, which is pretty much the same as the original Hungarian Rings except the rings intercept at an angle, making the design much more elegant. With the rings intersecting at a 3D plane, the puzzle looks more complex, but in reality it's slightly easier to solve than the original version, even though the mechanism is the same. 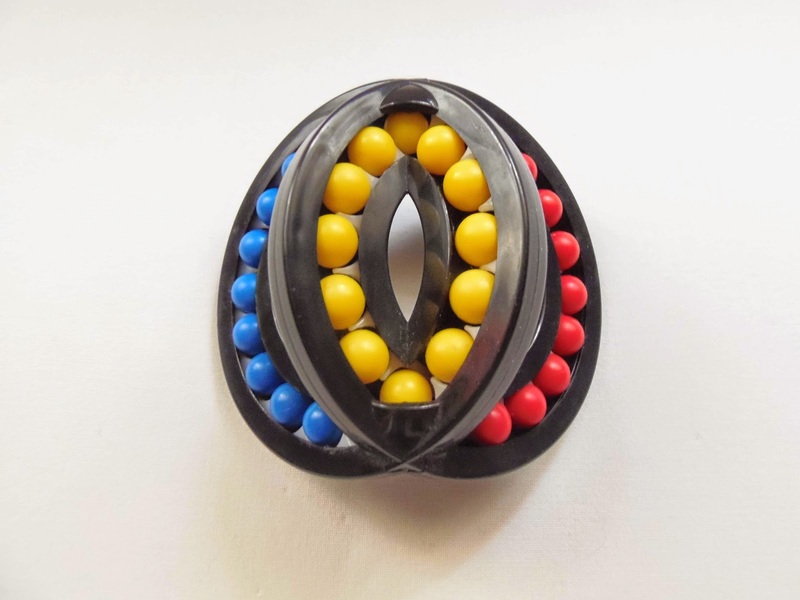 The main difference is that the Rubik's Rings have only three different colors (blue, red and yellow), whereas the Hungarian Rings have four colors. Another difference, which is more subtle, is how the balls move. In the Rubik's Rings, they are harder to move, but there's a reason for that - It's so that the balls don't move unintentionally. The Hungarian Rings had a very loosely mechanism, which sometimes had the undesired effect of moving the balls by accident. The goal of the puzzle is very straightforward. Simply mix the balls as much as possible and then try to regroup them in the same colors. Red or blue go in either of the sides and yellow goes in the middle. That's because there are 12 yellow balls, and 11 blue and 11 red. 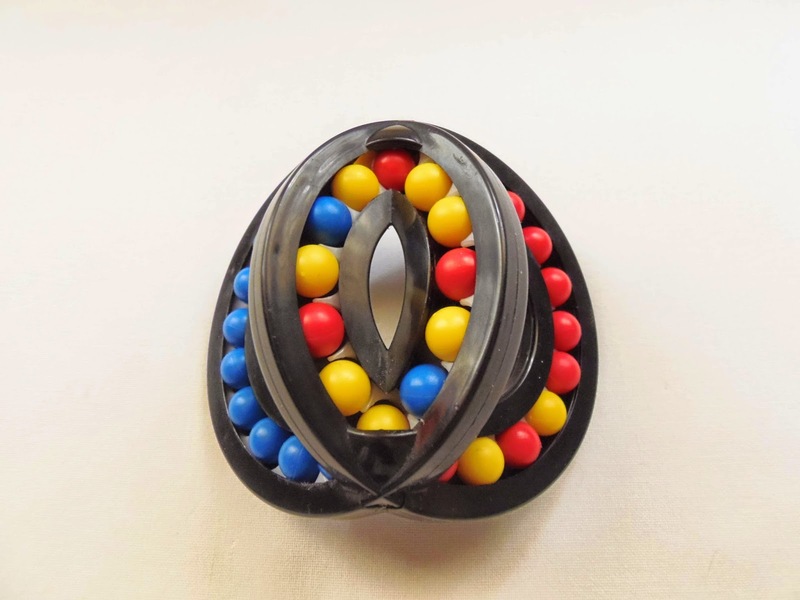 Mixing the balls is easy and fun, but as expected, solving it is much more challenging than just rotating the rings. If you have experience with the Hungarian Rings, you'll find this one very easy. If you never solved the original version, however, it might get quite frustrating returning the balls to their original positions. I can get you a hint, which is to solve first the yellow balls, and then separate the red and blue ones. It will get easier with practice, so just keep trying until you succeed. The Rubik's Rings are, to me, the best Hungarian Rings variation. It's actually less challenging, which can be good for many of you, but it's also a more interesting and beautiful design. Definitely recommended for any enthusiast. 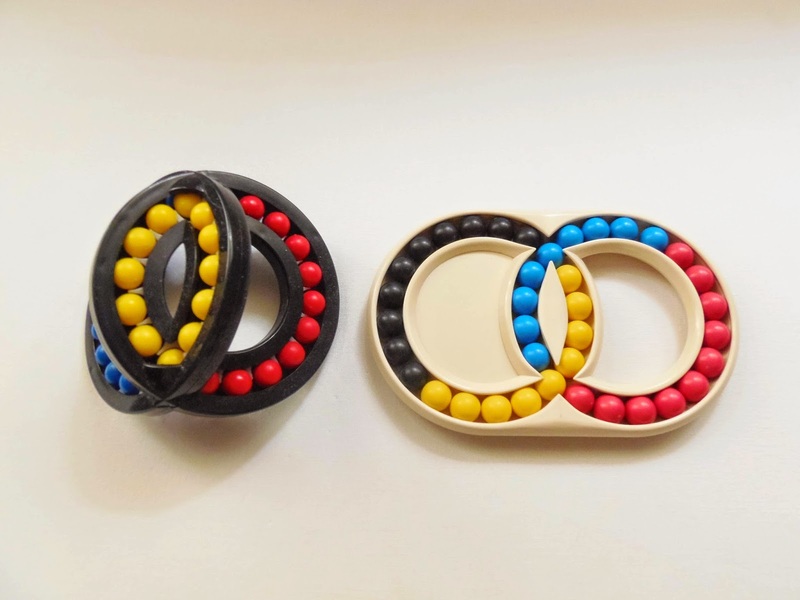 Availability: You can get a copy of the Rubik's Rings at PuzzlesdeIngenio.com for just €9.95. 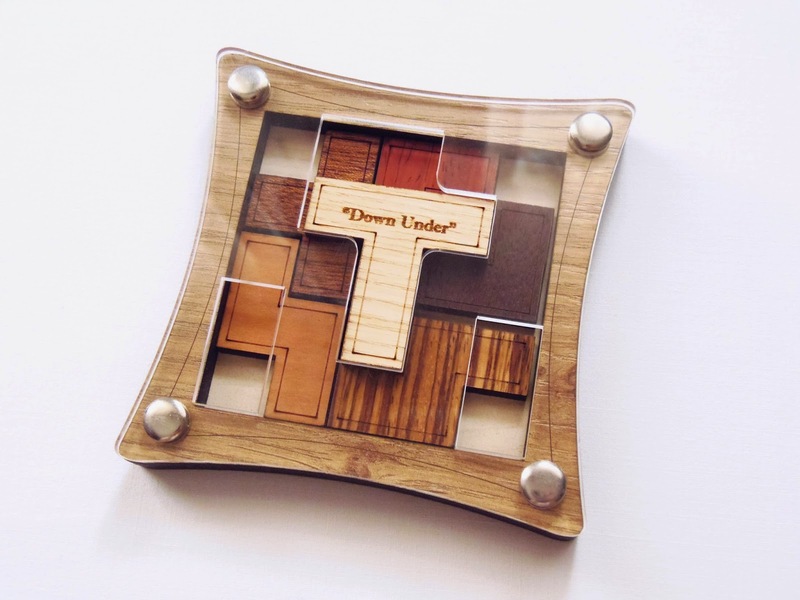 Dave Janelle from Creative Crafthouse may very well be the best craftsman at creating stunning Picture Frame puzzles. His portfolio features almost 50 designs already, and choosing the best looking one is a near impossible task. At any rate, The Orchestra Pit is a serious contender for the most beautiful Picture Frame puzzle yet. Dave chose to include in this design 13 different instruments that you'll probably find an any orchestra pit. Some of them I didn't even knew their names: Bass, Cello, Drum, French Horn, Harp, Oboe, Piano, Sax, Timpani, Trombone, Trumpet, Violin and Xylophone. The pieces are made in different hardwoods, displaying this way a multitude of colors which gives it a more elegant look. Each piece is cut very carefully and precise, and features very fine details that otherwise wouldn't be possible. Only one side of the pieces is etched with the characteristic details, so you can only use that side when you're solving the puzzle. 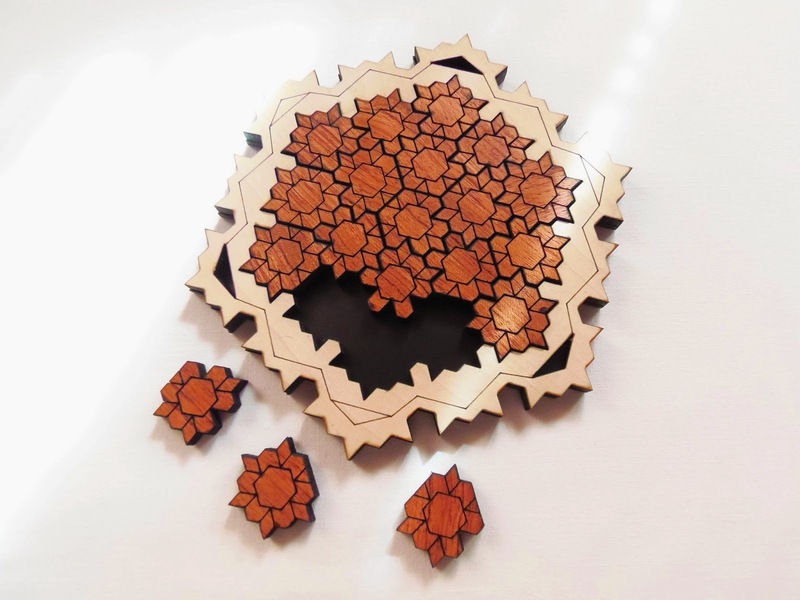 This version of the puzzle comes with a protective wooden cover, and measures 19cm in diameter (7.5") - A nice feature of Dave's puzzles is that they're quite large, which enhances their overall presentation. 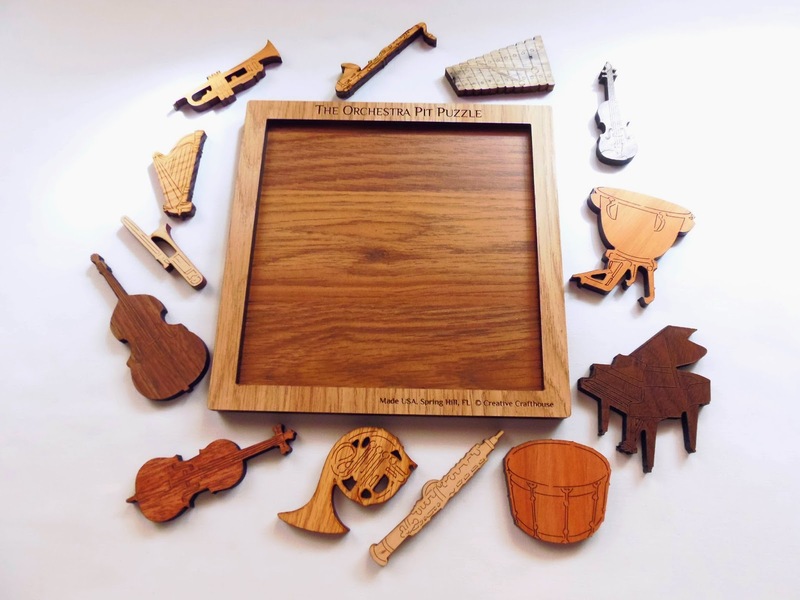 As you may already know, the difficulty of any of these Picture Frame puzzles can be rather challenging, and The Orchestra Pit doesn't disappoint in that regard. In Fact, this is one of the hardest I've tried so far, and as of writing this review I haven't been able to solve it on my own. You can see the solution below that I had to photograph, but even if you see the solution and attempt to solve it later on, it may prove to be a pretty frustrating task. Please, note that the puzzle comes shrink-wrapped in its solved state. If you don't want any spoilers of the solution, be sure to unwrap it upside down. 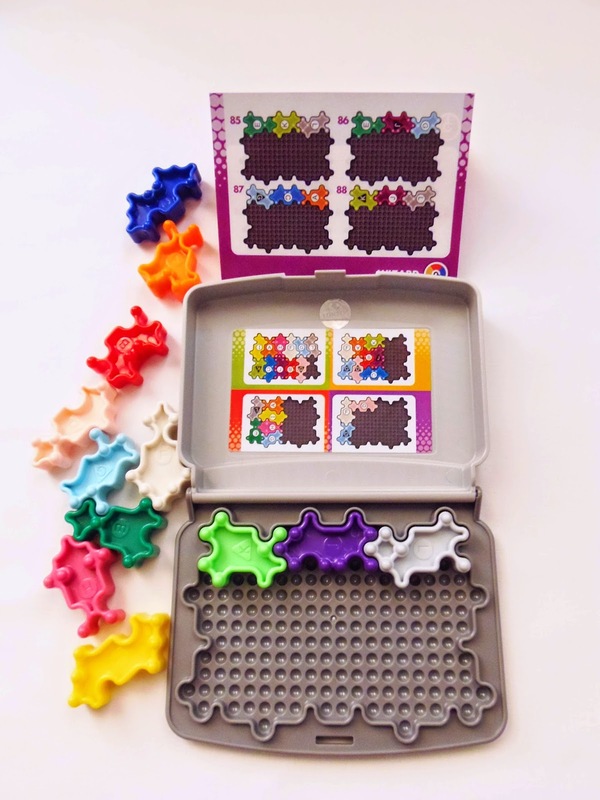 One of the main features of Picture Frame puzzles is the way the pieces interact with each other. Some pieces are quite big, so more difficult to pack; others are small and slim, which make them easier to cram in smaller spaces. Since there'll always be empty spaces in the frame, even when all the 13 pieces are tightly packed, you need to make the most out of every sharp edges and crevices on each piece, connecting them like a jigsaw puzzle - A very difficult jigsaw puzzle, I might add. 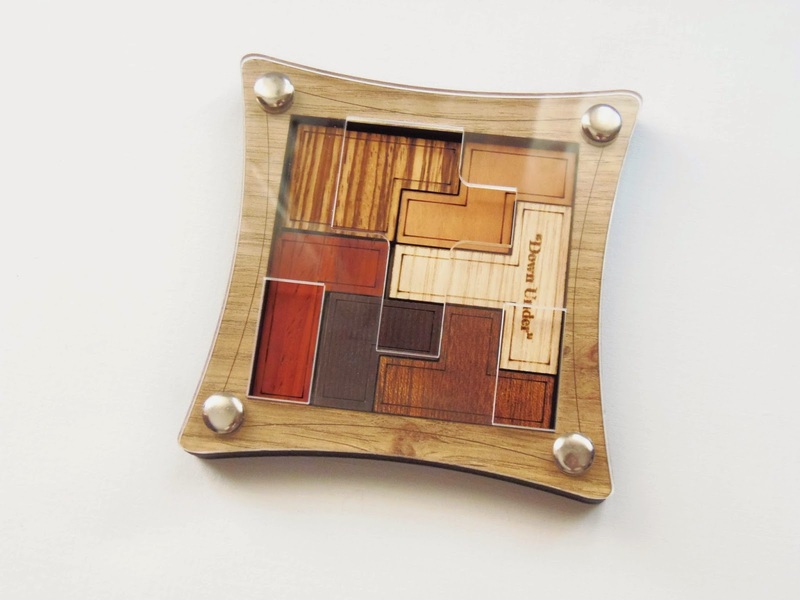 Picture Frame puzzles are perfect coffee table puzzles. Put them visible on a table at any social gathering and see everyone eager to try their luck. The Orchestra Pit is a beautiful work of art in its own right, even if you're not into puzzles, so this one is highly recommended. 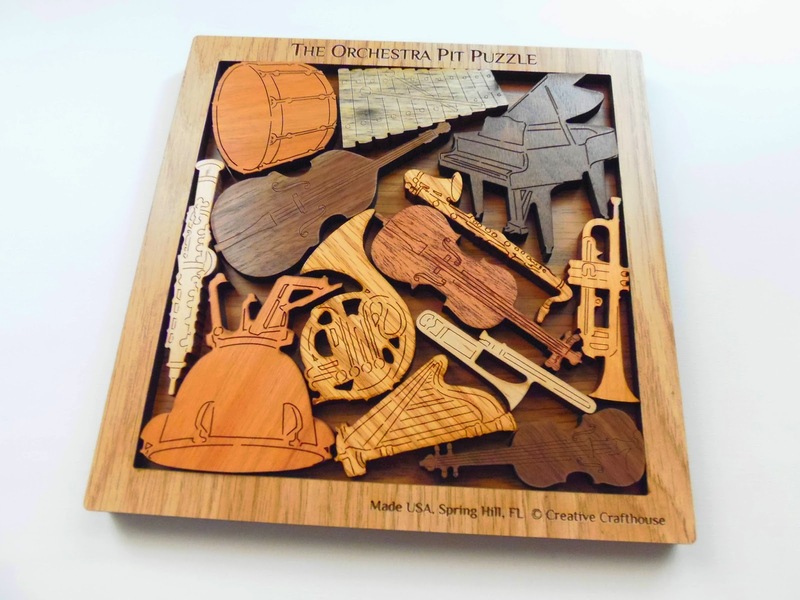 Availability: The Orchestra Pit is available at PuzzleMaster for $32.99 CAD. Click here to browse other puzzles by Dave Janelle. Temple Trap, like the name suggests, puts us in the role of an Indiana Jones-type character. The adventure consists of navigating a shifting maze full of perils and escape it without getting trapped. 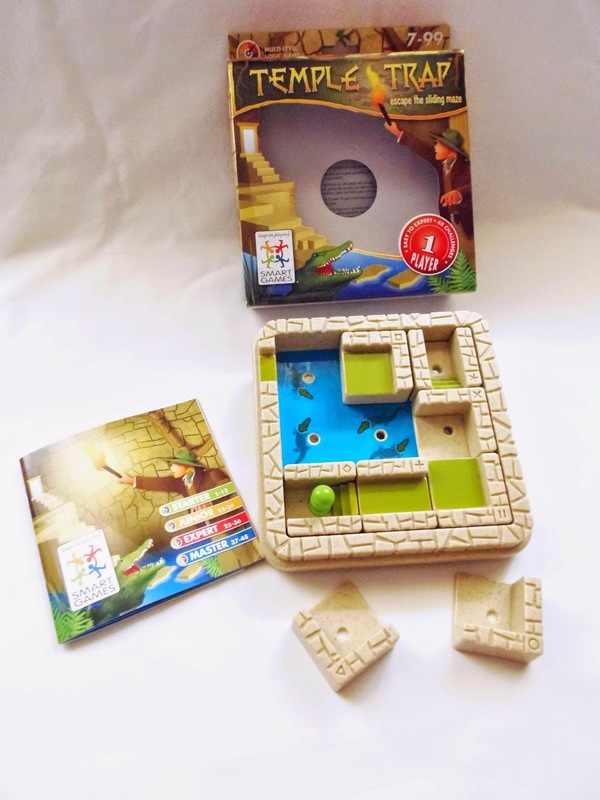 The game features eight sliding pieces that need to be constantly moved around, so your pawn can go from point A to point B without falling into the water filled with crocodiles. The first twelve challenges are easy enough to get you acquainted with the game and learn the ropes. As you progress, so the difficulty will increase as well. Can you manage to solve all 48 challenges and be a true hero of the jungle? As always, there are a few rules to keep in mind when you're attempting to solve a specific challenge. The only allowed move for the pieces is to slide them from one spot to the other. You can't exchange two pieces at opposite sides, for example, or lift them. Your pawn can only move within the path provided by the pieces. No jumping over the water. There are some pieces with holes and some without holes. Your pawn has to move from one spot with a hole to another with a hole as well. The pieces without holes represent a second level. To solve any challenge you need to go to the second level by using a piece with stairs. Always. These are the basic rules, but there are other subtleties you need to be aware of. One of these subtleties is the symbols found at the edge of every piece. 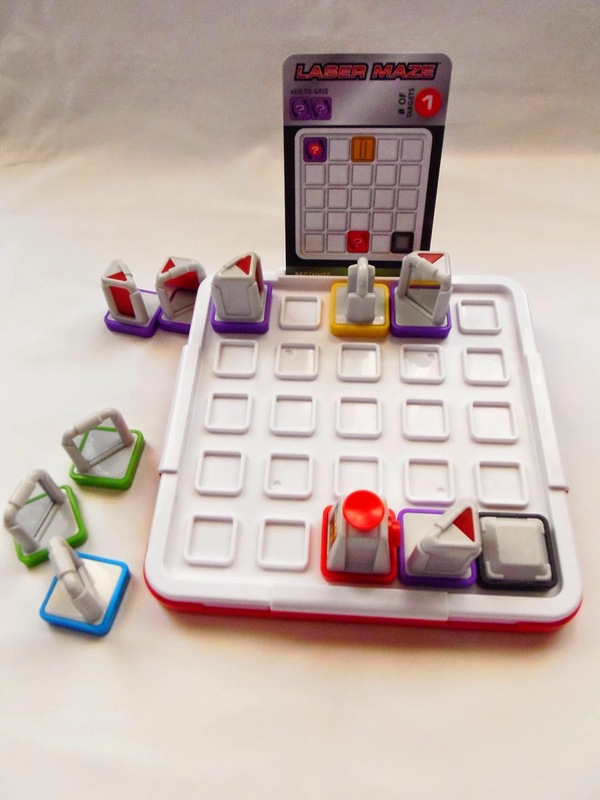 These allow you to quickly identify each piece as you set up a challenge, and to help you follow the solutions in case you need guidance in any tougher puzzle. The difficulty of the game, as you'd expect peaks at the last few challenges, the Master level. I found these last ones quite difficult, although when you reach this level you'll be prepared for most of them with the experienced gained from previous levels. Nevertheless, and even though you have plenty of challenges to keep you occupied for a while, I would've liked a few more challenges. Maybe 60, or even 100. Unless the limitations of the puzzle prevent it to have more than the included 48. Whether you're a 7 or a 99 year old kid, the amount of fun you'll have with Temple Trap will be about the same, as the game will manage to awake the adventurer in you. If you're on the fence about this one, I believe there's 48 great reasons to give this one a try. 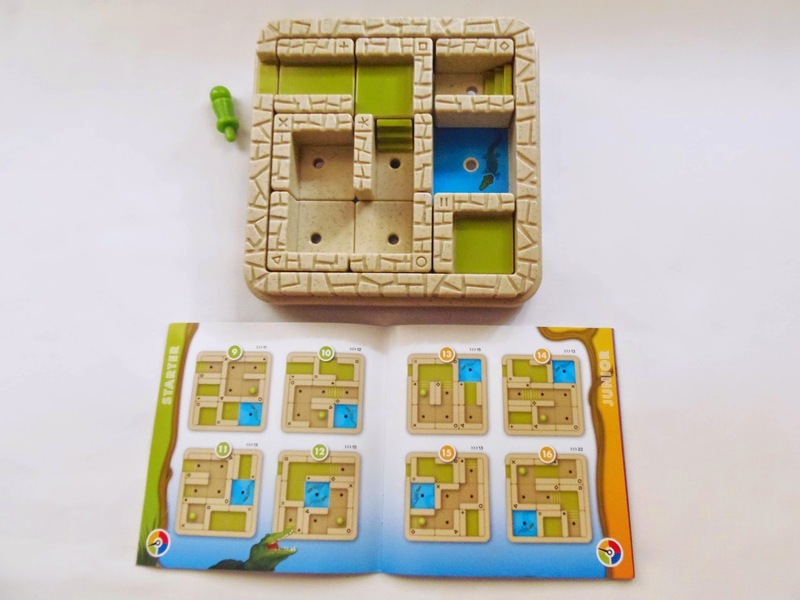 Availability: Temple Trap can be purchased at PuzzlesdeIngenio.com for about €15. You can also purchase other games from SmartGames. 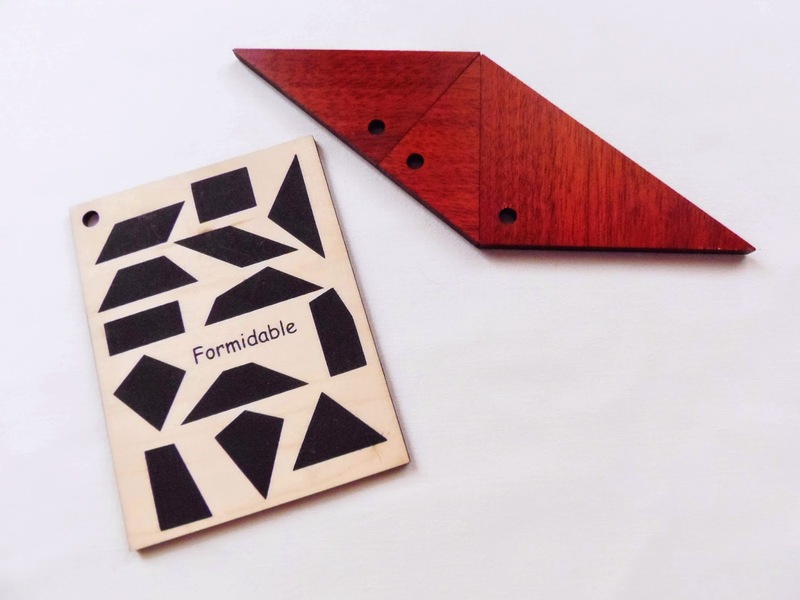 As a fan of the classic Tangram puzzle, I am always interested in any type of variants available. Some are really good in capturing the simplicity and yet addictive concept of creating all kinds of geometric shapes, others not so much. Fortunately, Jean Claude Constantin's Formidable puzzle falls in the former category. On a curious note, the name of the puzzle is not a German word this time - A rare sight. With only three pieces, this puzzle couldn't be simpler. 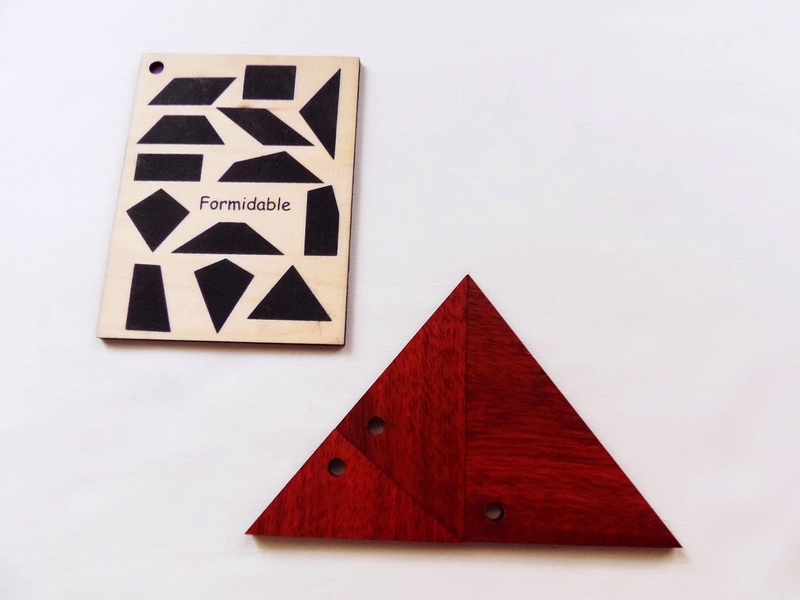 It consists of three right triangles of different sizes, made with laser-cut wood, which is lighter but of lower quality, and comes with a rectangular board with 13 shapes painted on it. This board is not part of the puzzle itself, which I thought at first. All shapes must be done with all three triangular pieces only. All four wooden pieces have a hole in one of their corners, so you can attach a string to keep them from getting lost. Just like a Tangram, the three pieces comprising the Formidable puzzle can make countless shapes, not just the 13 shown. Making a specific shape is relatively easy, although some of them might be harder to solve than others. I was able to make all included shapes in about half an hour, so overall I'd say it's much easier than the classic Tangram - I remember taking lots of time with just one Tangram shape, but then again a Tangram has seven pieces and a lot more possible assemblies. PuzzleMaster rates this as a level 7/10, but it really varies depending on the shape you're trying to solve. I would actually rate it as an average of 6/10, because most shapes only require you to change the position of one or two pieces from one shape to another. Update: This puzzle was actually developed by mathematician Georg Brügner, known as Drei Dreiecke Tangram. Constantin only presented with a different design including the board with 13 shapes. Even though you can go through all 13 shapes pretty quickly, I find this as a perfect puzzle to keep around you for when you take a break from work. Even when you solve all included shapes you can always try to find new shapes, so there's a lot of potential in this little puzzle. 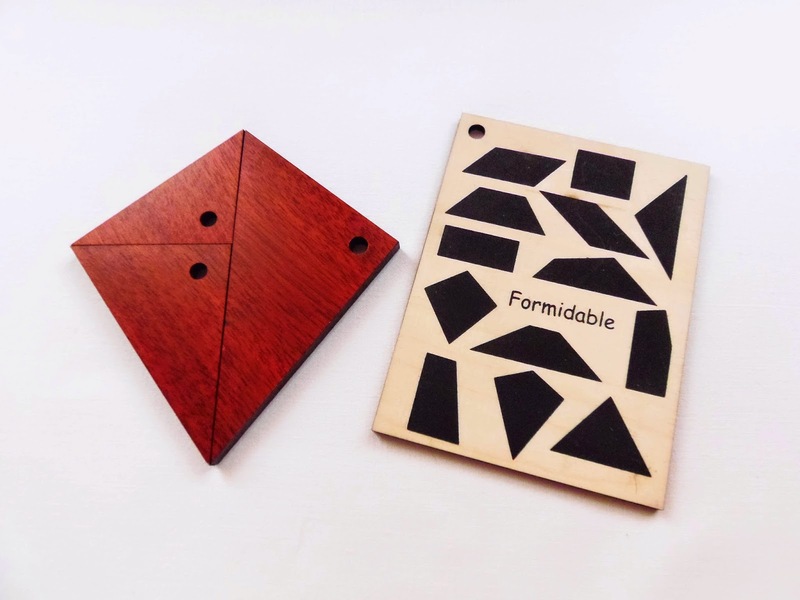 Availability: Formidable is available at PuzzleMaster for just $12.99 CAD. You can also check other designs by Constantin. 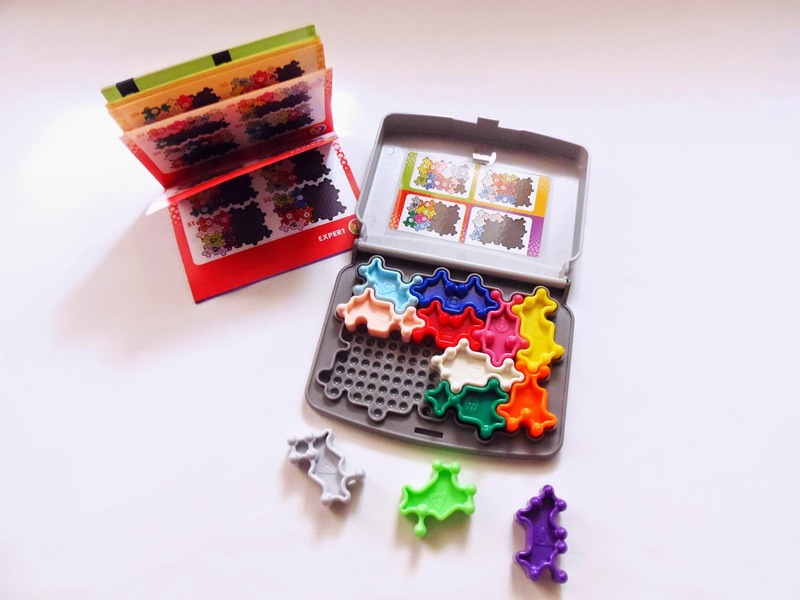 A few weeks ago I reviewed the Ladybird puzzle by Robrecht Louage and Michel van Ipenburg, a perfect collaboration between two respected puzzlers that resulted in a series of pretty interesting designs. 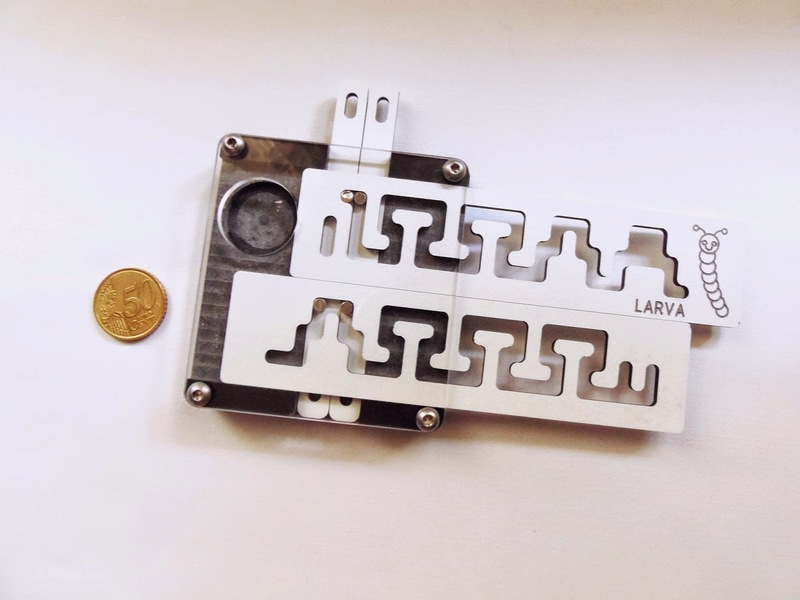 Today I present you another one of those puzzles, the Larva. 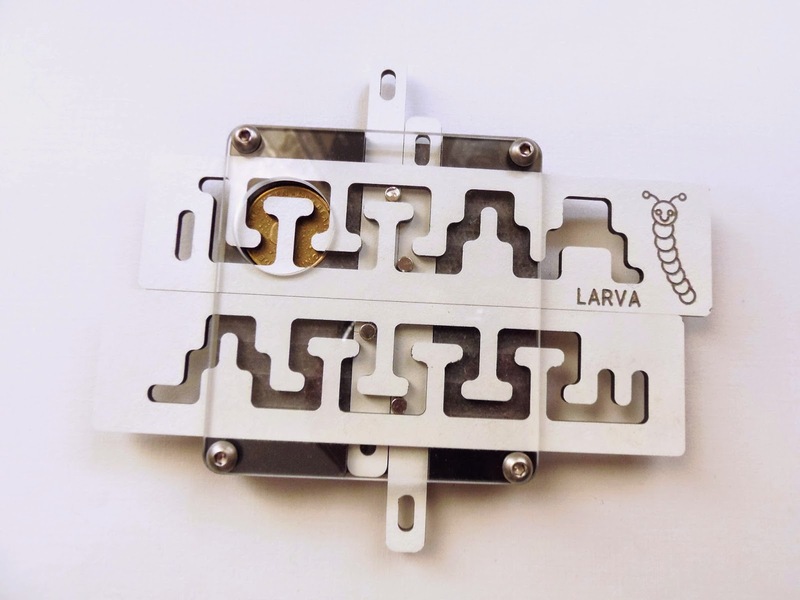 The Larva follows the same principle as the Ladybird, except this time you have two sets of metal studs that you need to guide through two independent mazes instead of two overlapping ones. 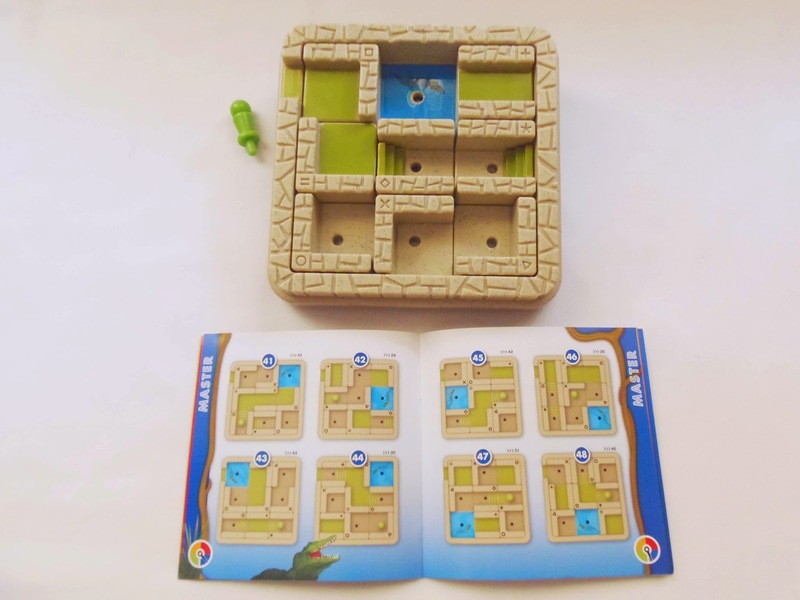 The two mazes are slightly different from each other, but both sets of studs need to get to the end of each maze at the same time. You move along each maze by pushing or pulling on the two vertical bars, while sliding the mazes horizontally. It's as simple as that. The materials used in this puzzle are basically the same as well, with trespa and acrylic. This one is a little smaller, however. The acrylic frame measures 8cm x 8.5cm (3.1" x 3.3"), but the mazes extend beyond the length of the frame, both measuring 14.5cm (5.7"). 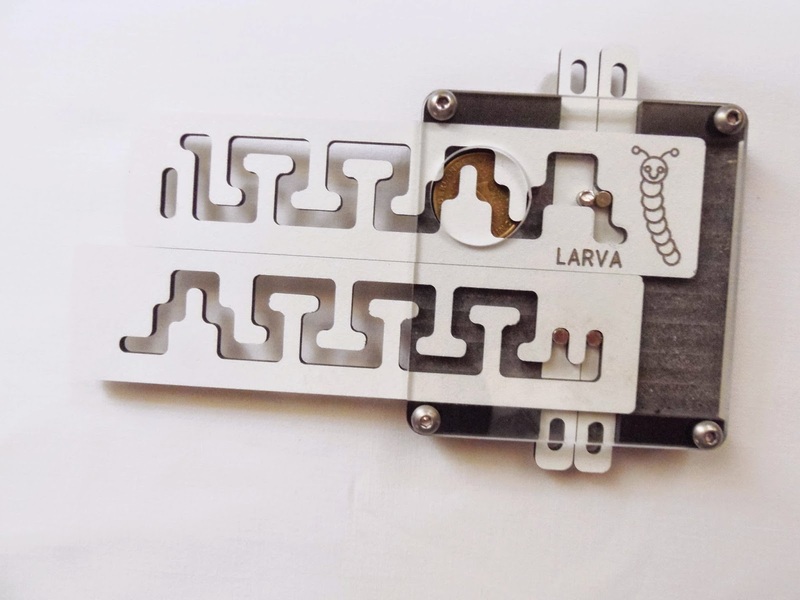 The design of the Larva is less flashy than the Ladybird's, but that doesn't mean it's less fun. I like both design approaches. While they try to differentiate the two designs by having the mazes in a different configuration, the concept is intrinsically the same. Personally, I don't see this as a bad thing, because I liked the challenge the two of them offered. However, if you didn't like one of them, chances are the other won't make you change your mind either. 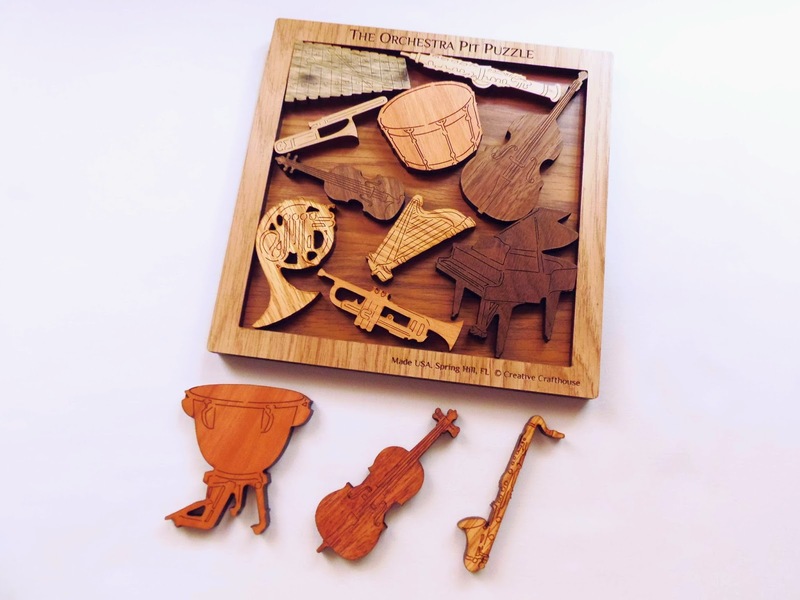 Availability: These puzzles were made in limited quatities, so you should act quickly if you want one of these. Note also that there are two other designs by these two designers, so if you really like this type of puzzles I would urge you to get them all before they become out of stock. You can contact Robrecht at "rlouage(at)telenet(dot)be" or you can get in touch with Michel (if you don't have his contact, drop me an e-mail). Down Under by Siebenstein-Spiele (designed by Jürgen Reiche) is what I like to call a dynamic packing puzzle. 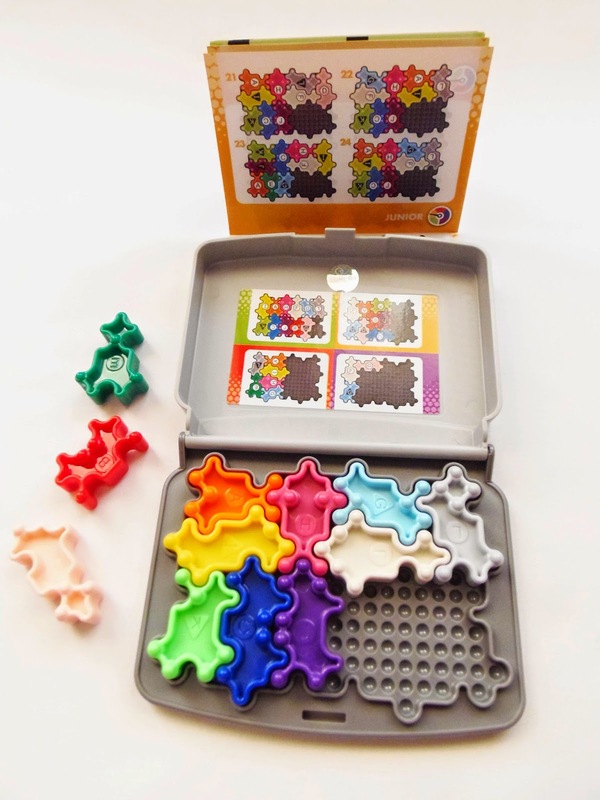 These puzzles have always more than one goal, which makes them much more attractive than a simple and traditional packing puzzle. Jürgen took the usual pieces used in the majority of packing puzzles (a triomino, three tetrominoes and two pentominoes) and turned them into a whole new puzzle. 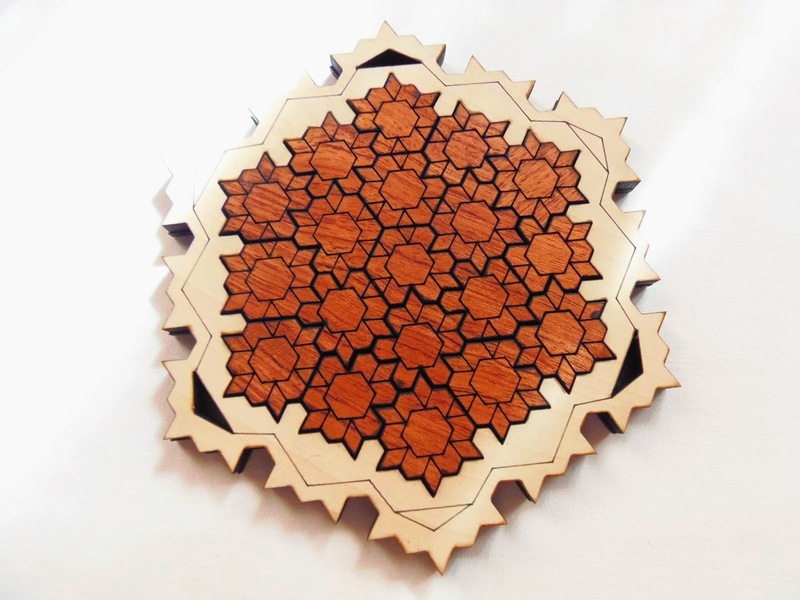 Made with laser-cut wood and acrylic, the puzzle consists of six distinct pieces, all made with a different type of wood. The acrylic covers 11 of the 25 units of the frame, which means there's a few holes in it that will help you move the pieces around, but it can also be a way to prevent some moves. When you receive the puzzle, you'll see the T-shaped piece on top of the other five pieces. Removing the T piece will reveal that the other pieces are packed in such a way that they can't move, although there's some empty spaces available. The empty spaces equal the same area of the T, so there's at least one way to fit all the pieces in the frame without empty spaces left. The main goal of the puzzle is to get the T inside the frame with the other five pieces, but there's also a couple other challenges you can attempt to do. But first, the main challenge: Removing the T is easy enough, but getting the other pieces out requires a careful sequence of movements, since the openings in the acrylic are narrow. Equally challenging is replacing all six pieces on the frame. You need to pack them in a specific order, so it's best if you already know how they're going to be arranged. I suggest you try to solve the puzzle outside the frame first, and when you manage to solve the 5x5 square with all the pieces, think of a way to pack each piece at a time to recreate the same pattern you did before. If you're having trouble fitting the pieces inside the frame try to rotate your piece configuration by 90 or 180 degrees. The first couple of pieces can comfortably be rotated inside, since there's still a lot of room to shift them around. With each additional piece packed, it becomes harder, so choose wisely which piece goes first. The other challenges seem interesting as well, although I didn't have time to solve them yet. They consist of getting fewer pieces inside the frame in such a way that they can't move in any direction. Do this with five pieces, then with four, and also with only three pieces. There's at least one solution for each. I noticed that the puzzle currently on display at Brilliant Puzzles is a little different from mine. The frame has straight edges instead of concave, like mine, and the acrylic cover is mirrored from mine, although it doesn't affect playing at all. Also, the pieces have only two tones and mine has six. If you're picky about your puzzles, make sure you contact them before placing an order to know which version you're gonna get. I personally prefer the one I got, for obvious reasons, since it looks much better. Down Under is a lovely puzzle. Although it's rated as a level 4/5, I reckon it's a little easier than that, but still challenging and fun enough to entertain you for a while. Availability: Down Under is available at Brilliant Puzzles for $25.95 USD. You can also get other designs by Siebenstein-Spiele. MindJewel is yet another interesting puzzle released by the Dutch company Recent Toys. 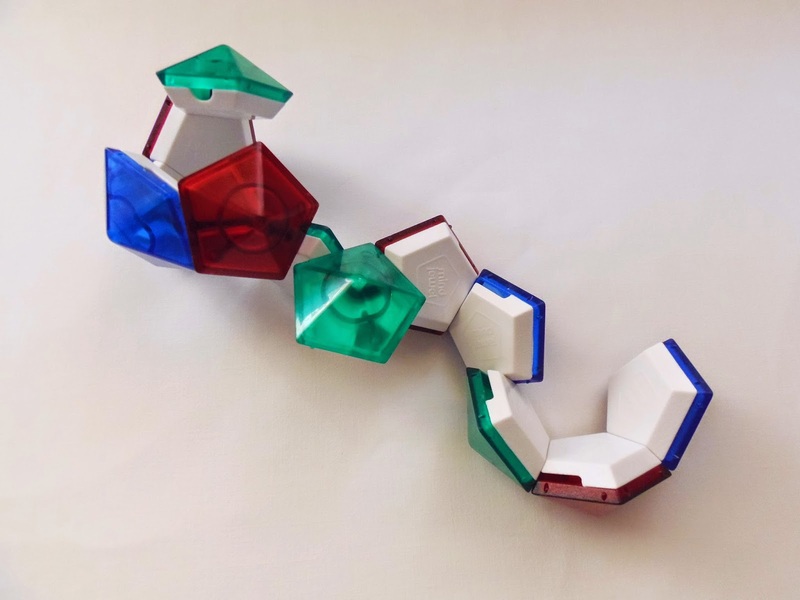 Invented by Alexander Polonsky in 2012, MindJewel is an Assembly colorful puzzle where the idea is to dismantle it and then reassemble it into a closed shape, a dodecahedron jewel. The concept used in the MindJewel is similar to another one used in the Elastic Cube, where an elastic rope is used to join the pieces together into a continuous string. 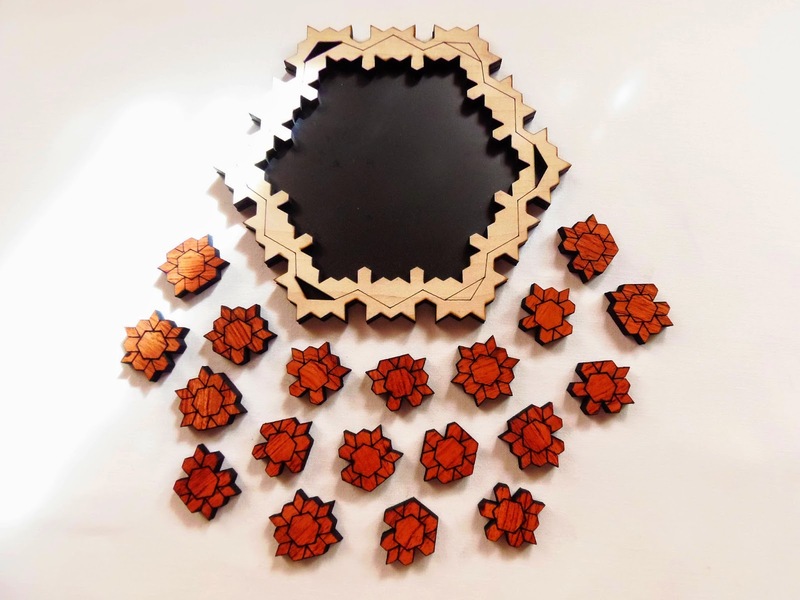 After the puzzle is disassembled, which is not that difficult, you need to figure out how to connect the pieces into the original shape, which is a little more challenging and fun. Mindjewel is composed by 12 pentagonal pyramids, all connected by an elastic rope from one end to the other. The puzzle comes in its original state, so its easier to visualize how it's supposed to look like when solved. At first, it might look like the puzzle doesn't come apart, but when you study it in more detail, you'll discover that the first piece comes off pretty easily, followed by the others in quick succession. In no time, you'll have the dodecahedron shape undone and all the pieces laid out in a zig-zag line. Now the real fun begins, as you struggle to put the puzzle back together. 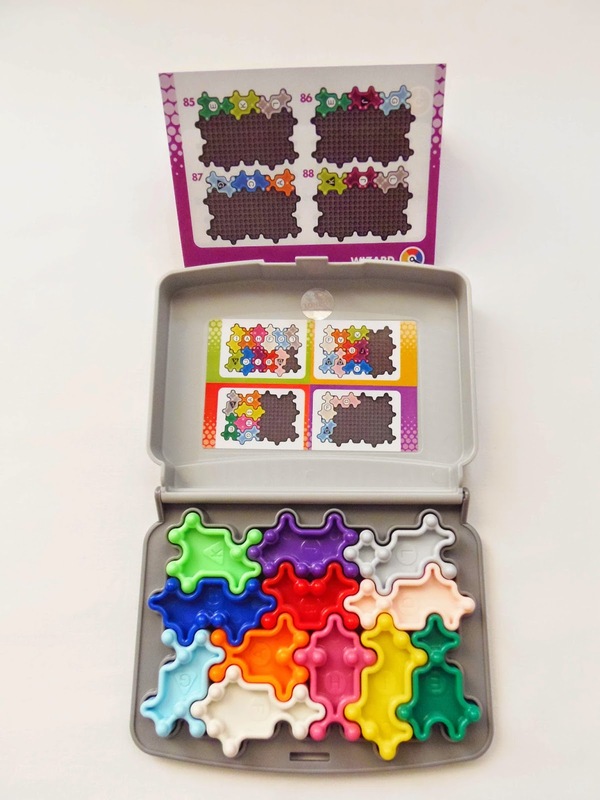 The design of the puzzle is also quite interesting. 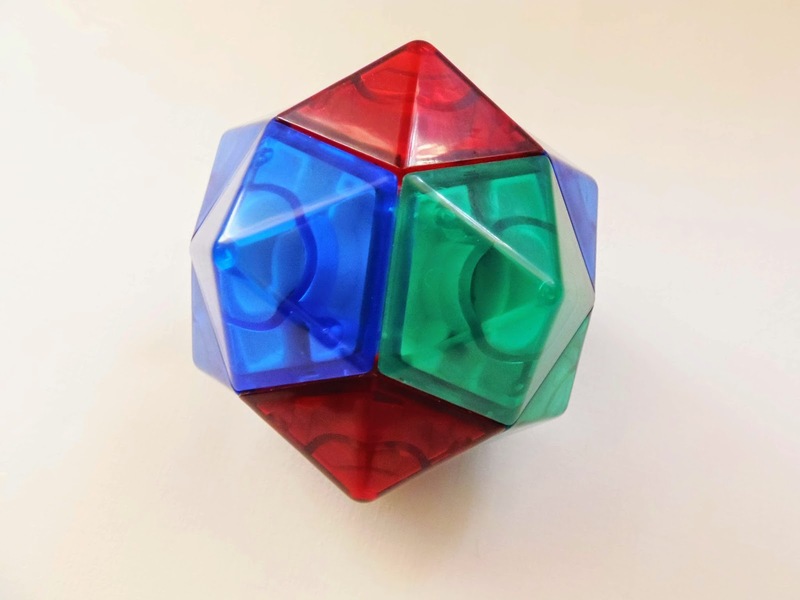 Measuring about 9cm in diameter, each of the 12 pyramids is made from a transparent plastic in three different colors (red, green and blue), giving the puzzle a shiny and translucent appearance, reminiscent of a real jewel. This puzzle looks a little more challenging than the Elastic Cube, but not that much actually, as both puzzles can be easily solved with a little patience. With the exception of the two pieces at both ends, in each of the remaining 10 pieces you can change the direction or the angle at which the elastic can be connected with other pieces. This makes the task of reassembling the puzzle a little more difficult, unless you don't change its directions when you disassembled it. Each pentagonal piece also has a tiny hole and a protuberance on its five edges, facilitating the connection between the pieces and keeping them in place, avoiding that they slide off from the original shape. MindJewel by Recent Toys is a nice addition to any collection. It won't be challenging enough for an experienced puzzler to feel satisfied, but as a fun puzzle to keep around and entertain you while you wait for a doctor's appointment or a meeting, is a great acquisition. Availability: You can find the MindJewel puzzle at PuzzlesdeIngenio.com. Click here for other designs by Recent Toys. Glückspilz (German for someone who always has luck) is yet another Jean Claude Constantin stunning and original design. This one belongs to a special category among Packing Puzzles, where an extra piece needs to be accommodated to an already packed frame with not much free space to work with. I particularly like this type of puzzles, mainly because the solution is often quite elegant and unexpected. The name of the puzzle fits perfectly with its shape and pieces. 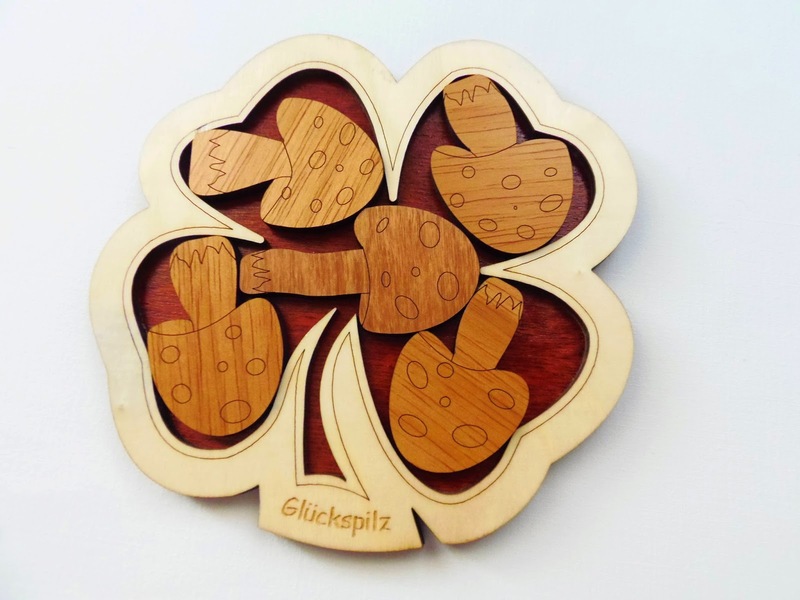 Glückspilz is actually a combination of two words: Glück, which means luck or fortune, and pilz, meaning mushroom. So, for the overall shape of the puzzle, Constantin made it in the shape of a four-leaf clover - a traditional symbol of good luck. 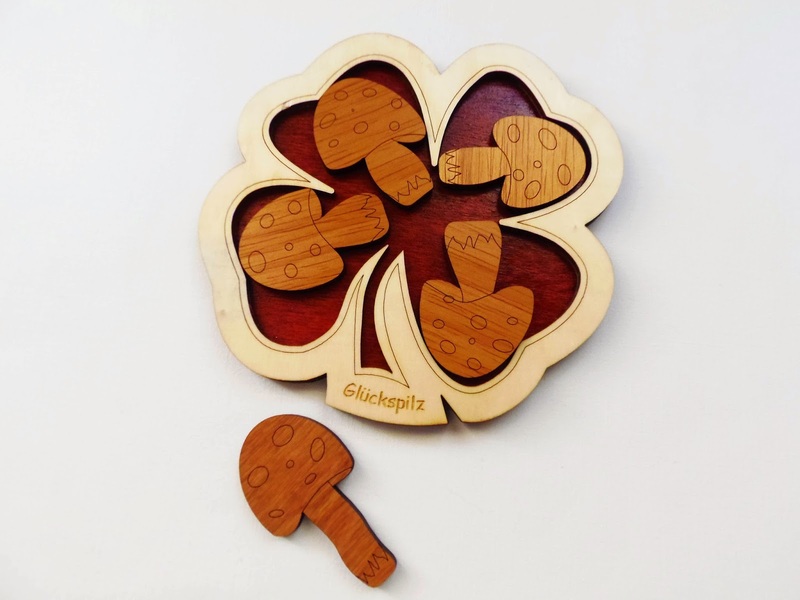 Inside the frame, and already packed, are four distinctly-shaped mushrooms occupying four larger slots that follow the contours of the clover's leafs. A fifth mushroom with a bigger stem than its counterparts is also provided but, as you can immediately see, it can't possibly be fitted with the presented configuration. It's up to you then, to find the correct way to pack all five mushrooms inside the frame. Getting all five pieces inside the frame is no picnic. This is rated as a level 7/10, and I completely agree, because it's not extremely difficult, but still a bit challenging nonetheless. Apparently there's at least two solutions, since mine is a little different from PuzzleMaster's. At any rate, both solutions leave almost no wiggle room for the pieces to move, even though there'll still be empty spaces. As a hint for solving the puzzle, don't start by packing the four main mushrooms in the frame. First and foremost, you should try to find a good spot to place the special mushroom - the one with the bigger stem - and then work around it, placing one piece at a time to see it fits tightly in any of the remaining four open spaces. There's a good dose of trial and error involved, but nothing frustrating. Carefully study the shapes of each individual mushroom and the space available. For most people, this should be solvable within 30 minutes. I always have great things to say about Constantin's designs. The man just can't make bad puzzles. Glückspilz is a perfect example of his craftsmanship and original ideas. For fans of this category or puzzles in general, this is indeed a magnificent gift. Availability: As of writing this review, the Glückspilz puzzle is out of stock at PuzzleMaster. 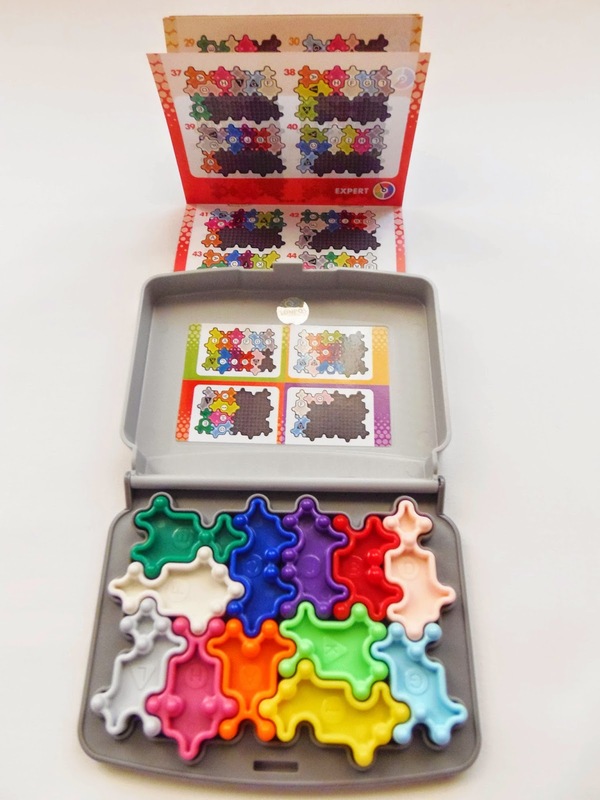 However, because Constantin's puzzles are so popular, you should find it again in the store soon.